PERSPECTOVISION® maps/map brochures provide you with an innovative marketing package that combines your message with your image to influence prospective clients to make your establishment their choice. Attract even international clients to your location - visual mapping help overcome language barriers. Recruit high caliber employees - giving a recruit an easy quick guide to get to an interview will also reflect your company's caring employment image and corporate identity. 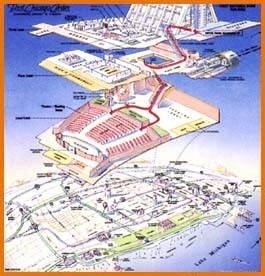 In addition to a map, there is room for promotional copy, photos and graphics. The effect is to motivate users and investors at first glance. Revisions can be made very easily making the map a long lasting marketing piece. Great for healthcare, universities, corporations and tourism. And we can update your PERSPECTOVISION® map! Some of our clients have used theirs for decades. Your map is guaranteed to be top quality!